Why Did Moroni Quote the Patriarch Jacob about a Piece of Joseph’s Coat? 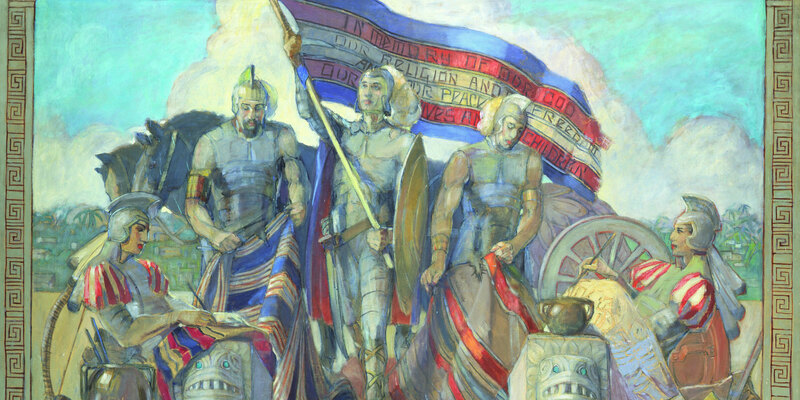 Moroni and the Title of Liberty, Minerva Teichert. 1. Copies of the title of liberty were made and were hoisted upon various towers and in cities throughout the land of Zarahemla as symbols of loyalty and solidarity; see Alma 51:20. 2. John A. Tvedtnes has noted a potential Hebraism in Alma 46:19. The earliest rendition of the text reads that Moroni “went forth among the people waving the rent,” as in the rent part of the garment. See Royal Skousen, ed., The Book of Mormon: The Earliest Text (New Haven, CT: Yale University Press, 2009), 441. This was corrected in later editions to read “the rent part,” as in English “rent” is used to refer to a tear, not a piece of torn fabric. However, biblical Hebrew does have a word that would correspond to “rent” as a noun for a torn piece of fabric (cf. 1 Kings 11:30). See John A. Tvedtnes, “Hebraisms in the Book of Mormon: A Preliminary Survey,” BYU Studies 11, no. 1 (1970): 50. 3. For more on the presence of simile curses in the Book of Mormon, see Book of Mormon Central, “Why Would Zerahemnah not Swear an Oath to Moroni? (Alma 44:8),” KnoWhy 152 (July 27, 2016). 4. “War Rules,” in The Dead Sea Scrolls Reader: Volume I, ed. Donald W. Parry and Emanuel Tov (Leiden: Brill, 2013), Col. III, lines 13–14. See also Hugh Nibley, Since Cumorah, The Collected Works of Hugh Nibley: Volume 7 (Salt Lake City and Provo, UT: FARMS, 1981), 242. 5. Kerry Hull, “War Banners: A Mesoamerican Context for the Title of Liberty,” Journal of Book of Mormon Studies 24 (2015): 84–118. 6. Hull, “War Banners,” 118. 7. Hull, “War Banners,” 117.